I’ve been working with a company that has a lot of vagrant issues. Each night, homeless people come shuffling away from the bars in the center of town, looking for a convenient place to bed down for the night. They leave trash everywhere, so in an effort to discourage them, the company left the lights on at night. The bums just unscrewed the lights and shattered them on the ground. What do you do when you are worried about vandals breaking your lights? There are remarkably few products out there that are specifically designed for the task, but I’ve started compiling resources here to help you put together a simple system yourself. These tips are primarily tailored towards commercial outdoor lighting, but may have use on your home as well. Outdoor motion lighting is great for keeping out vagrants, even in poorly patrolled areas, because it keeps turning on and waking them up, and also exposes their location. The trick is making it vandal resistant. With this DIY motion sensor kit, you can make any light motion sensitive. The advantage with this kit is you can use lights built for durablility, and you can put the wireless motion sensor in a place where it isn’t lit up by the lights, and where it targets the desired area. Finding durable lights isn’t easy, but they are out there. I’ll post links below to the better lights I found. I started my search by looking for what they use as prison lights. Prison lighting has to stand up to the worst sort of abuse, but prison light fixtures are also really ugly and surprisingly hard to obtain. 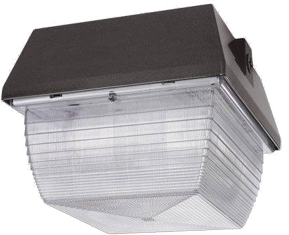 There is a large selection of vandalproof lighting available out there. Henry Ford once said that you could by his automobile in any color you want, as long as it’s black. These polycarbonate lights come in a wide variety of slightly different sizes and shapes, all of them ugly, none of them cheap. They redeem themselves in not having to be replaced, and by coming in a wide variety of light bulb styles. I don’t recommend fluorescent bulbs for motion lights. The ballasts just can’t take that many on/off cycles. Whichever light you choose, or even on existing lights in vandal prone areas, it’s a good idea to use a Teflon coated shatterproof bulb . This kind of rough service bulb is a bit more resistant to breakage, and removes most of your cleanup if a bulb breaks, as the shards stay inside the coating. Some of these bulbs are also 130 volt (works in a normal socket) which prevents them from burning out with small voltage spikes (the most common cause of an incandescent burnout). 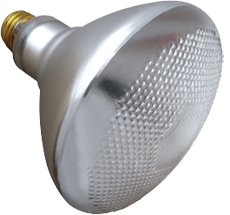 Once these bulbs are fortified and tamper-proofed, you don’t want to have to get In there to replace them all the time. Alternately, you could use an LED bulb or fixture. They are a bit more durable by nature since there is no filament to break, but they are also dimmer. My choice for the moment are these lights by Designer’s Edge . It’s important to get the bulb up high out of their reach to reduce their options for tampering with the light. Vagrants aren’t going to stand around throwing rocks at a fortified fixture for any length of time. It may be that even the appearance of durability will be a good deterrent. 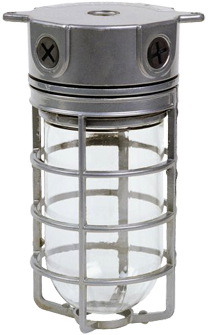 These lights have a metal shell surrounding a tempered glass enclosure. They look durable, but not ugly, and they come in both wall mount (pictured top) and ceiling mount varieties (left). 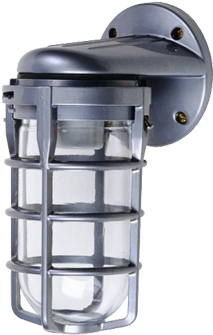 The ceiling mount light has 1/2-inch IPS thread on the top and sides for convenient wiring and a good weather seal.